Ilan Joseph is a Real Estate Broker with Sutton Group and is co-founder of a 10-person award-winning Toronto, Thornhill and Vaughan real estate team. You can find him on LinkedIn, Twitter, YouTube and Google+. For over 10 years, Ilan has provided more than 1500 buyers and sellers valued advice and service, enabling them to reach their real estate goals. He’s kind of like the Bruce Willis of real estate. 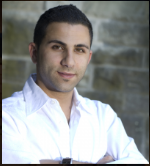 DESIGNATIONS: ABR®, e–PRO®, AMP, Broker Follow @TopTorontoAgent With real estate running deep in his blood, it was only a matter-of-course that Ilan would find himself at the top of the industry. Known as a vibrant, energetic go-getter with a zest for life, Ilan has always been a natural leader on a mission. His passion for life can be seen in the way he lead’s his clients through real estate; always on the hunt for the next great deal, ensuring top results for those he is representing. Ilan constantly immerses himself in all aspects of Toronto’s real estate market, exploring and picking out the very best it has to offer. His keen eye for quality with his endless drive to be the best at what he does has quickly made Ilan one of Toronto’s top brokers.